Lots of tonal options make this unit an interesting option for guitarists looking to expand their tonal palette with more than one aggressive rock sound. 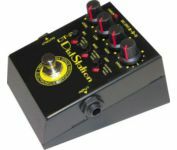 Features: The DT-2 is housed in a metal enclosure and sports the following controls - four rotary knobs (Level, Low, High, Dist) and three sliding switches (Mic, Mod, Amp Selector). It has a 1/4 jack IN and OUT connectors and can be powered via 9 volt battery or a power supply adapter (not provided). The DT-2 is a bit on the light side compared to the typical distortion box from most of the competition and the build doesn't quite inspire confidence. At the current price range one can't help but wonder why AMT have cut costs by putting in plastic IN and OUT jacks instead of the industry grade metal connectors. The unit has a power LED on the top right showing on/off status and is switched via a metal on/off switch. The rotary knobs and the sliders for Mic, Mod and Amp Selector have a bit of a cheep feel to them. The unit comes with a 1 year warranty as opposed to the traditional 3 year warranty from most other manufacturers, so this also doesn't build up my confidence. As far as the design of this unit is concerned, it looks to me like a different take of the Sansamp idea - you have bunch of amps, voicings and speaker positions. In the case of the DT-2, on the "Amp" selector you get "Tweed", "British" and "California" selections via a slider. The "Tweed" sounds like a Vox on crunch settings, "British" is typical Marshall grind distortion, and the "California" is voiced similarly to a Mesa Rectifier amp. The "Mod" slider lets you pick the hotness of the amp, with 3 settings: "Classic", "High Gain" and "Hot Wired". Next you can pick the mic positioning with a 3 settings slider - "Classic", "Center" and "Off Axis". According to the printer on box manual this pedal could be used to record direct as it has speaker emulation or it can be hooked in a traditional way to a powered amp. The DT-2 also has 4 rotary pots that control sound level (Level), EQ (Low, High) and the amount of distortion (Dist). In Use : The DT-2 is a very useful distortion box with lots of configurable sound options so in most cases on a single amp you'd be able to fine tune and get several settings that work well in the style you're looking for. In my case I was looking for a main distortion sound, so after having my cleans dialed in, I plugged in through the clean channel of an Ashdown Fallen Angel 60 watt head and started punishing it with the DT-2. I settled on the California setting, High Gain Mod, Center position. This provided a sound reminiscent of a Mesa amp with maybe a little more grind than the usual. The same settings but with British voicing on the first slider provided a sound closer to a JCM2000 amp at full blast, so I had two high gain sounds that I liked so I could pick what I need according to the application, which in this case was a speed metal/thrash type of sound. I found the Tweed setting to be usually tamer, more suited to classic rock and blues, although it was a little grindy for some of these sounds and it felt a little rough. The Mic settings worked best on Classic and Center as I discovered that the Off-Axis provided a sound that was akin to pickups wired out of phase. I wouldn't call it realistic to Off-Axis mic sound but it does have its uses if you want a bitier tone with less bass and mids. I found this pedal to cover most hard rock and metal territory well, although it could get a bit rough at times.The pedal doesn't match volume levels well within changing settings so you have to be adjust each time you change a slider. This didn't affect the overall sound but you couldn't compare two sounds equal in volume to choose which one was better without playing the volume level. The eq is okay - I can't say that I am impressed as the controls were kinda loose and not very focused, especially the Lows. It is serviceable but I was hoping for a more responsive eq section with a better voicing. This unit also could use a mid eq, which could've been priceless considering the tonal options on tap. To get better control of the mids I did patch in an eq pedal before the DT-2 and that worked well, but I do see that as a miss on the manufacturer's end, especially considering that this unit costs two times the price of most distortion units. Stomping on the unit is a bit tacky as it is on the light side, so when you step on it it feels a little wobbly. Recording direct provided a decent sound although this unit probably wouldn't be my first choice for that. Still - quite serviceable if you want to just patch in and jam or make a portable rig, which is what I did during a recent power outage - I plugged in the DT-2 to a portable stereo and got some pretty decent jam sounds. Overall the DT-2 is an interesting multi-sound option that could possibly suit any guitarist looking for more than just one sound in a distortion box, especially in the metal and hard rock genre. Value: A little pricey but for the multitude of sounds it is worth it.